Maine Mendoza didn't let the so-called "network wars" affect her decision in writing a simple yet encouraging message to Janica Nam Floresca, the girlfriend of the late Franco Hernandez of the ABS-CBN boy group Hashtags. On Instagram Stories, Janica shared the touching message Maine surprisingly dropped via DM. She described the 22-year-old Eat Bulaga host as "Beautiful inside and out." 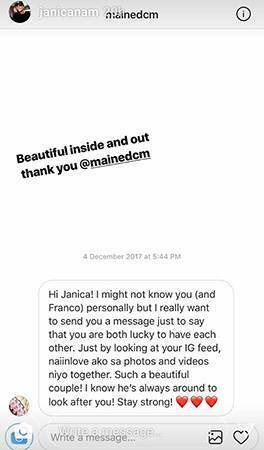 Maine's message read, "Hi Janica, I might not know you (and Franco) personally but I really want to send you a message just to say that you are both lucky to have each other. Just by looking at your IG feed, nai-in love ako sa photos and videos niyo together. Such a beautiful couple. I know he's always around to look after you. Stay strong." The inspiring message was sent to uplift Janica's spirits after Franco's untimely passing in November due to a boating accident.